Electricity generation currently accounts for ~40% of primary energy consumption in the U.S. and continues to be the fastest growing form of end-use energy. Power electronics condition, control, and convert electrical power in order to provide optimal conditions for transmission, distribution, and load-side consumption. Most of today's power electronics have limitations to their performance, temperature resilience, and size due to the circuit topology and semiconductor power devices used. Emerging semiconductor devices such as those based on wide-bandgap materials -- along with transformative advances in circuit design and system architecture -- present opportunities to dramatically improve power converter performance while reducing size and weight. 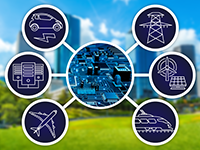 Development of advanced power electronics with unprecedented functionality, efficiency, reliability, and form factor will help provide the U.S. a critical technological advantage in an increasingly electrified world economy. The University of Illinois, Chicago (UIC) will develop a new high-power converter circuit architecture for fast charging of electric vehicles (EV). Their wide-bandgap universal battery supercharger (UBS) is designed using a unique AC/DC converter system. Fast-switching silicon carbide (SiC) field-effect transistors (FETs) with integrated gate-drivers are used to achieve the targeted compactness. A novel hybrid-modulation method is used to switch the SiC-FETs to reduce the semiconductor power losses and improve the efficiency. The UBS uses integrated filters, which reduce the electromagnetic noise and system weight. The UBS circuit is reliable because it uses film capacitors instead of electrolytic capacitors that have reduced durability. The reduced weight and size of the UBS can enable both off-board stationary fast charging systems and as a portable add-on system for EV customers who require range enhancement and quick charging in 15 minutes. If successful, project developments will not only help accelerate the development of EV charging infrastructure, but the system will have bidirectional power flow capability enabling vehicle-to-grid dispatching. If successful, CIRCUITS projects will enable further development of a new class of power converters suitable for a broad range of applications including motor drives for heavy equipment and consumer appliances, electric vehicle battery charging, high-performance computer data centers, grid applications for stability and resilience, and emerging electric propulsion systems. More robust power electronics that withstand higher operating temperatures, have increased durability, a smaller form factor, and higher efficiency will significantly improve the reliability and security of a resilient electrical grid. Low cost and highly efficient power electronics could lead to more affordable electric and hybrid-electric transportation, greater integration of renewable power sources, and higher efficiency electric motors for use in heavy industries and consumer applications. Electricity is the fastest growing form of end-use energy in the United States. High performance, low cost power electronics would enable significant efficiency gains across the economy, reducing energy costs for businesses and families.